The business world can be brutally competitive. In most industries each company views any other business that produces a similar product or service as a potential threat. An immense amount of effort is spent on protecting business secrets and trying to corner as large a share of the market as possible. When a competitor falls on hard times it is generally looked on as a positive, a way for your company to fill the resulting void and strengthen your own position in the market. While there is some of this cut-throat attitude in parts of the beer industry, it is refreshing to see how much individual breweries try to support one another. Sharing ideas, collaborations, and even sharing ingredients and equipment has become commonplace across the industry. Night Shift Brewing took this to another level recently. While they could have easily capitalized on the void created when neighbor Idle Hands lost their brewery, Night Shift instead allowed Idle Hands to keep their brand going by guest brewing at their Everett facility. Night Shift even keeps a dedicated tap for an Idle Hands beer. This is the type of business I want to support, doing the right thing even if it isn’t necessarily the best way to maximize profits. It also helps that Night Shift makes some delicious beer. One recent example is Maracuya, an American wild ale brewed with passion fruit. 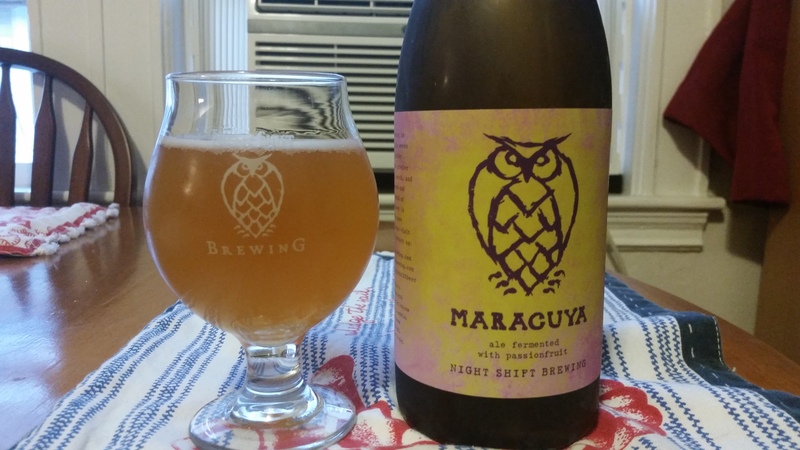 Night Shift Maracuya is available on draft and in 750 mL bottles on a rotation basis. Night Shift Maracuya pours a cloudy deep orange with a mild white head. The scent is a mixture of tart acidity and tropical fruit. The passion fruit leads the flavor, strong but not overpowering and contributing just a hint of sweetness. This is balanced out by a the sour flavor, which adds a little bite without being tongue numbing. The malts round out the flavor with some whole wheat bread and added body. The beer is very drinkable, some sour beers wear out my palate over time, but I could sip this on the porch all afternoon. Some of the beer-info websites list Maracuya at 7.4% ABV, which would be a little strong for the style, but the batch I bought is much more reasonable at 5.6% ABV. The finish is clean with some lingering tart fruitiness. Maracuya is a really nice beer, complex and flavorful but balanced and easy to drink. Night Shift remains the masters of adding a wide range of adjunct ingredients to beer without overwhelming the core flavors. Hoppy Boston score: 4.5/5.